Overpopulation, depletion of natural resources, hunting of nonhuman species to extinction: paleontologist Niles Eldredge questions the long term survival of humans, given our propensity for living beyond our ecological means. 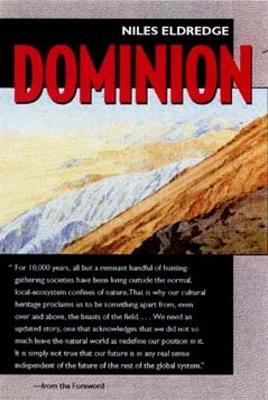 In Dominion he reviews the relation between biological and cultural evolution, showing how the agricultural revolution freed humans from dependence on local ecosystems and allowed us to assert our dominion, as the Christian Bible has it, over the beasts of the field. Unless we quickly change our homocentric ways, we'll irretrievably destroy our own habitat.